Flipping through the channels on LG smart TVs will soon yield some new results, with the inclusion of Internet-based channels from Xumo. Xumo is a streaming-video service that combines Internet videos into continuously running channels. Each channel revolves around a particular brand or publisher, including BuzzFeed, The Young Turks, GQ, and Vice, and shows up in a program guide that users can scroll through. 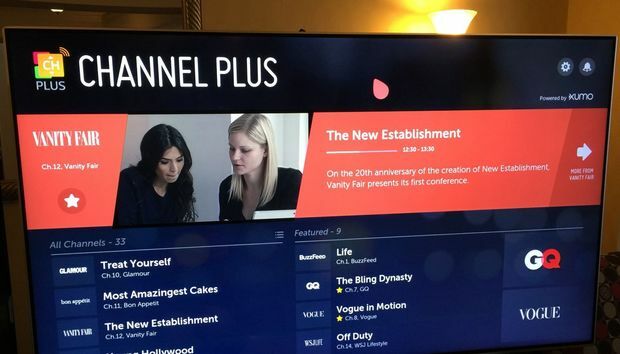 At CES, LG announced that its WebOS 3.0 Smart TV platform will have Xumo’s service baked into the channel guide—a service that LG is calling “Channel Plus.” But that won’t be the only place where Xumo is available. Its app is also getting built into smart TVs from Vizio (with a dedicated button on the remote) and Panasonic. The company is also planning standalone apps for streaming boxes such as Apple TV and Roku. Xumo lets users select on-demand videos after tuning into any live channel. The idea of stringing Internet videos into live channels is not new. Another example is Pluto.tv, whose app is already available on mobile devices, Chromecast, Apple TV, Roku, Amazon Fire TV, and Android TV. I’ve previously written that Pluto is the most underrated app for people who’ve cut cable TV. Xumo’s interface on Vizio and Panasonic TVs. In any case, it’s encouraging to see more services that to solve Internet video’s “leanback” problem, making it easier for users to start watching something without having to put in much effort. Other examples include the Sony-owned Crackle, an ad-supported service that added its own channel-based experience last year, and CBSNews, a round-the-clock streaming news service that includes anchored coverage. Xumo will also be supported by ads—its holding company, Viant, is an ad tech firm that also owns MySpace—but is also planning an a la carte subscription model for its individual channels. By early Q2, the company is hoping to be on 20 million devices, and it says more TV partnerships are coming.